Tips For Kicking Cigarettes Out of Your Life! Keep a tally of the cigarettes you smoke each day. Record the total number of cigarettes you smoke. Buy only one pack of cigarettes at a time. After the third day of the program, switch brands. Smoke "anti-cigarettes"; that is, smoke brands you generally would never smoke, ones that are distasteful to you. Change at least two things about the way you smoke. For instance, you might hold the cigarette in the other hand, smoke with the cigarette on the other side of your mouth, inhale faster or slower than you normally do. Make two areas of your home and workplace "no smoking" areas. Delay smoking 30 minutes after meals. See it you are able to go 10 waking hours without smoking one day. Begin a thorough cleanup of your environment: Have your clothing cleaned, get rid of all ashtrays; clean smoke film off windows, mirrors, and other surfaces. Write down your thoughts about your smoking habit and how you will eliminate it. Start a program of oral hygiene: Brush your teeth one extra time every day, and make an appointment for dental cleaning approximately one month from now. Give yourself two 5-10 minute quiet periods per day. Close your eyes, breath deeply, think relaxing thoughts, and imagine throwing away your cigarettes. Set a date within the next week or two when you will stop smoking completely. Choose a day this week when you will stop smoking completely. Continue "routine" stop-smoking activities using anti-cigarettes, buying one pack at a time, keeping count of how many cigarettes you smoke, and so on. Drink less coffee, tea, and alcoholic beverages, especially if you tend to smoke while you drink them. If you often have a cigarette during a coffee break or while having a drink after work, for instance, skip the coffee or the drink. During your daily quiet periods, program yourself with images of how successful your efforts to stop smoking will be. Make four areas of your home and workplace "no smoking" areas. 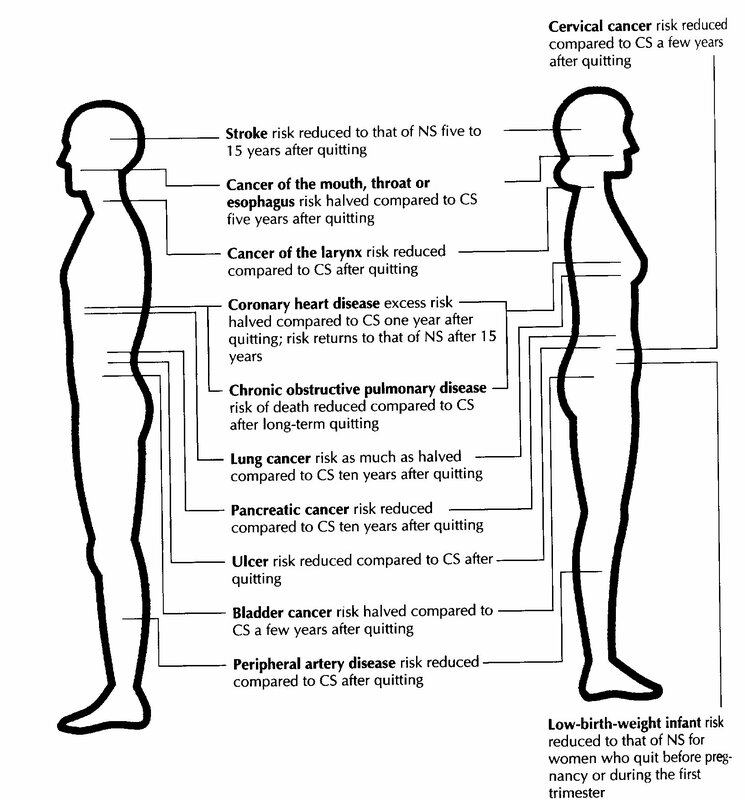 Watch smokers: Note how unpleasant the habit is. Look at smoking ads. Ask yourself, "What is this ad saying to me? What is it trying to sell me?" Delay smoking for one hour after meals. After going one hour without smoking, take your pulse. Then smoke two cigarettes rapidly, and take your pulse again. Think about what smoking does to your heart rate. Go a full day without smoking, as a trial run. Stop smoking completely on the day you told yourself you would. Impotence: The risk of impotence increases 350% in smokers in the 40's vs nonsmokers, and 600% for those in their 50's. I guess the movies with the virile smokers are just more marketing from Hollywood! Nicotine gum: dose of 2 mg q 1-2 hours for those smoking < 15 cigarettes per day, and 4 mg q 1-2 hours for those smoking > 15 cigarettes per day. Costs about $10/day for 16 pieces per day. No food or drink 15 minutes before use. Indigestion, jaw pain and mouth soreness are potential side effects. Nicotine patch: use 21 mg if smoking > 10 cigarettes per day, and 14 mg for those smoking < 10 cigarettes per day. Step down to 14 mg (or 7 mg) patch in 6-8 weeks, and then to 7 mg in after another 2-4 weeks (for 2-4 weeks). Costs about $4 per day. Side effects include skin irritation and insomnia (if worn at night). Nicotine nasal spray: Dose 1-2 doses (0.5 mg) in each nostril every hour for 3-6 months, then taper over 4-6 weeks. Costs $16 per day. May cause nose and eye irritation. This is the most addictive form of nicotine replacement. Nicotine lozenges: OTC; dose of 1 lozenge every 1-2 hours during the first 6 weeks, tapered to q 2-4 hours for weeks 7-9 and q 4-8 hours for weeks 10-12. Those who smoke their first cigarette < 30 minutes after awakening should start with 4 mg lozenge, while others start with 2 mg lozenge. Costs about $9 per day for 16 lozenges. May cause mouth soreness and indigestion. Bupropion (Zyban): Usual dose 150 mg qd x 3 days, then bid for 7-12 weeks. Costs about $5/day in 2006. Insomnia, dry mouth, HA, nausea, anxiety, and tremor are side effects. Do not use if you have ever had a seizure. Chantix (varenicline) has been available since 2006. It blocks the nicotine receptor in your brain. The usual dose is 0.5 mg once per day for 3 days, then 0.5 mg twice a day for 4 days, then 1 mg twice per day for 12 to 24 weesks. The main side effect (seen in about 40% of patients) is nausea. It costs about $4 per day.